A plumbing company’s billboard in Roanoke, Va., gave me a powerful reminder of just what the right message can do in recruiting. It would have stopped me in my tracks if I hadn’t been driving at 50 mph. So I looked up the company, found the name of the owner, and made a call. I asked for James Wisler. Which he did, late that day. James filled me in: Wisler Plumbing is a growing company, with a challenge finding people experienced in the plumbing trade in the Roanoke metropolitan area. He also has a compelling belief in trusted teamwork and serving customers well. whatever they’re asking our help with? He likes to ask candidates what they’ve learned from people who are much better at something than they are. 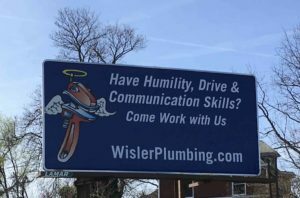 The billboard that caught me cold might be unique for a plumbing company, but the message is a natural part of Wisler Plumbing’s overall recruiting approach—as I learned when I explored the hiring section of wislerplumbing.com. James credits the book “The Ideal Team Player,” by Patrick Lencioni, for informing his recruiting philosophy and the billboard message itself. “The billboard text is a close translation of Lencioni’s view of the three things that make a great team player—he calls them humility, hunger, and smarts,” James said. James seems to have an instinct for creating the environment I believe employees need to thrive—where they believe in a shared mission, belong to a trusting community, and know that they matter to the company and its success. ler recruiting approach is a bright reminder for each of us to decide what’s really most important and then to select without apology—whether choosing new hires or new clients. It’s not that all will be well; it’s just that such selection tends to optimize things over time, and the clarity is so freeing. Well, James, you might be able to borrow messaging and hiring tips. But humility—that’s hard, and that’s yours. Previous Previous post: I was shocked by this survey question. My wife wasn’t.